History and experience tell us that the world shifts on its axis. Regimes crumble, industries disappear, jobs are lost, people die, power is lost or gained, and the regular monthly pay-check suddenly stops coming. The warning signs may be there but we refuse to heed them. Failure to prepare and meet change head-on is apparent in Lynn Nottage’s mighty Sweat at the Donmar, not a flawless play but an utterly gripping one which is given a terrifically vigorous production by Lynette Linton. 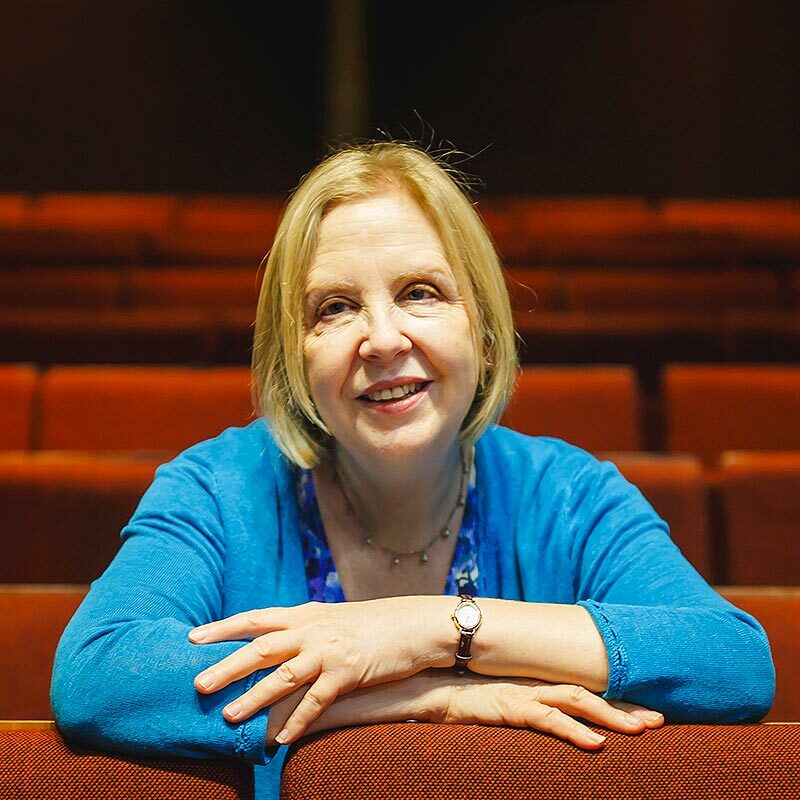 Linton is taking over as artistic director at the Bush, one of the welcome indicators of change in a theatre industry that for too long has lacked diversity in both its workforce, audiences and the stories its tells on stage. Leanne Best, Martha Plimpton & Clare Perkins in Sweat, photo by Johan Persson. The consequences of change are apparent too in Joe Hill-Gibbins’ swift, muscular and very messy revival of The Tragedy of Richard the Second at the Almeida. Simon Russell Beale’s doomed king, a believer in his sacred right to rule, is like an actor who finds himself imprisoned in a performance whose script has changed without him noticing. Russell Beale’s king is all the more moving for his failure to notice that his crown is only a paper one, until it is far too late. You are reminded of a child at a disastrous birthday party, lip aquiver and voice quavering amid the debris. There is something similarly tragic about Martha Plimpton’s Tracey at the end of Sweat, a woman as steely as the industry of her home town, Reading Pennsylvania, who crumbles and becomes Opioid-dependent when she loses her job. Plimpton’s generous, mobile mouth suddenly becomes as pinched tight as a handbag. 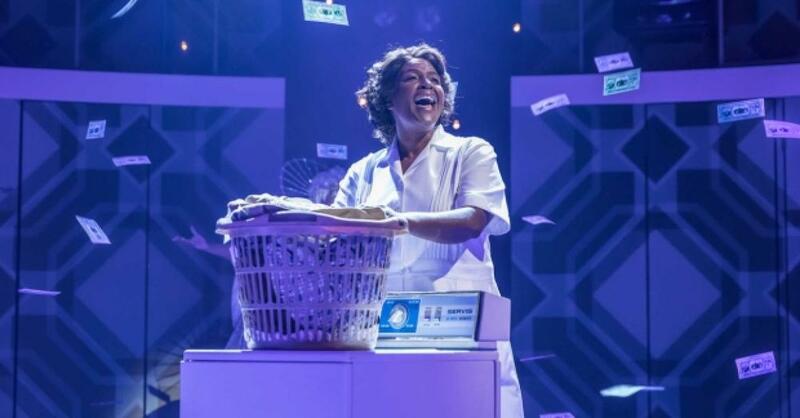 For Caroline—played with searing intensity by Sharon D Clarke in Tony Kushner and Jeanine Tesori’s Caroline, or Change at the Playhouse, change cannot come quickly enough. Stuck in the basement of a house in Louisiana in 1963 as beyond the windowless walls President Kennedy is shot and the civil rights movement gathers pace, Caroline the maid to a middle class Jewish family feels as if she has been buried alive without hope of escape. Young Noah, the son of the family, thoughtlessly leaves the change in his pockets that she could use to buy necessities for her children. When Rose, Noah’s nervous stepmother,  suggests that Caroline keep any change she finds in Noah’s pocket  to teach the boy a lesson, this slow burning, sophisticated and often playful musical (inanimate objects sing and dance) is set for an emotionally devastating final act. Caroline, which in Fly Davis’ clever design begins with a statue of a Confederate soldier centre stage, reminds us how the past continues to shape the future, and that sometimes change is too slow to bear. It is for Caroline who has been condemned to a living hell. Clarke’s eyes blaze with pain and bitterness. The agony is not just in watching her, but also her daughter Emmie (a terrific and physically distinctive performance from Abiona Omonua) her eyes so alight with determination and hope. She is going to change the world. Hindsight means we know that Emmie would be around seventy now, and as America has clearly shown over the last few years black lives still don’t matter enough. 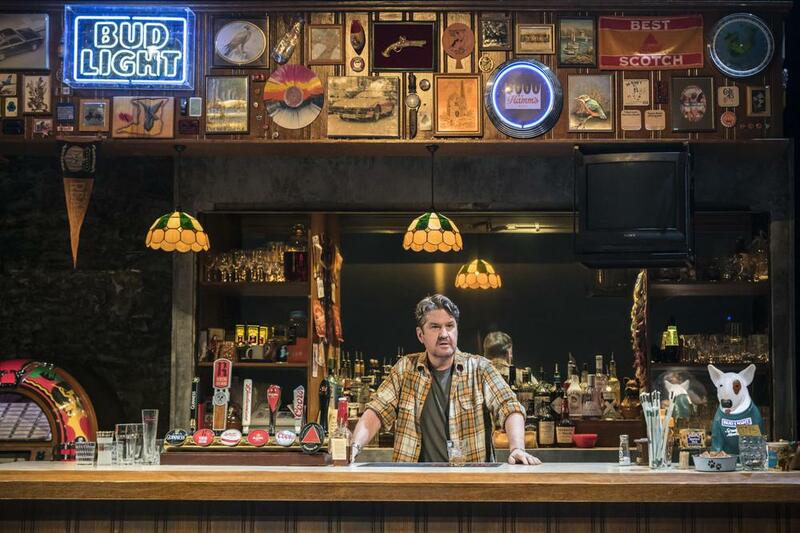 In Sweat, which opens in 2008 as the global crash takes hold, but harks back to the early 2000s, we see history being played out in front of our eyes on the TV set above the bottles in Mike’s Bar (smashing design from Frankie Bradshaw), where Tracey and her friends, all workers at the local factory, come to celebrate birthdays and the end of hard working days. They are secure in the knowledge that they have money in their pockets and a buoyant future retirement full of cruises. They pay no attention to Stan (Stuart McQuarrie) who, like the TV, offers warning dispatches from the outside world. So when shut-downs and lock-outs do come, with brutal suddenness, they are unprepared and fall back on nostalgia and racism. A previously tight-knit community falls apart. Watching Sweat I was reminded of Sonia’s great speech about work at the end of Uncle Vanya. Work doesn’t just bring money, it binds us together. When it disappears, communities crumble and resentments and fear surfaces. Particularly of outsiders. Nostalgia for the past corrodes our dreams of the future. We see that in Mike’s Bar in Sweat, and we have seen that in the Brexit vote in the UK swung by the communities far from the centres of power in London and Brussels who have been most hit and hurt by industrial decline and globalisation and have felt unseen and unheard. Sweat is a play about America, but it is also a play about the UK, the here and the now. It’s a play in which invisibility hurts and festers. And if Sweat is that play, then Hill-Gibbins’ Richard II is the production which demonstrates the consequences and the cost when a country’s leaders behave like clowns in their ridiculous quest for power. 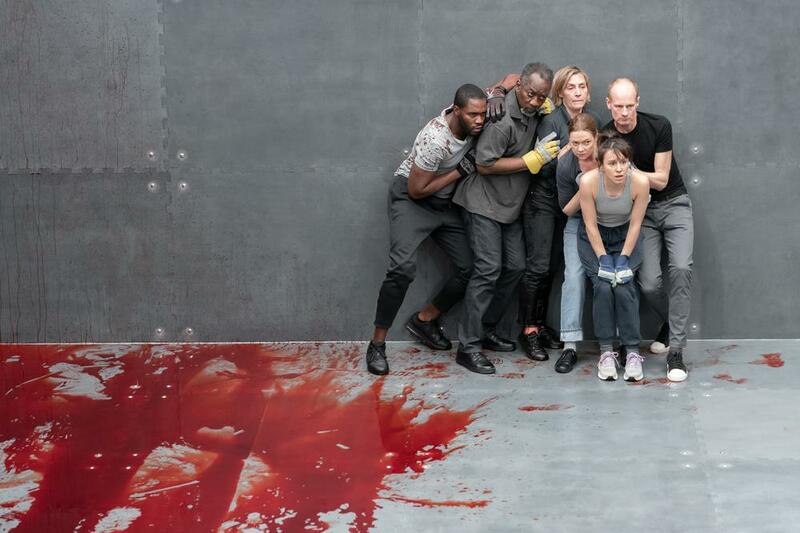 During its 100 minutes duration the stage becomes soaked with blood and water and soil. When the party’s over, there is an awful lot of clearing up to do. Somebody has to deal with the consequences, and it won’t be the rulers who pay. They never do.